Following the two free practice sessions earlier today where Andrew Jordan and Tom Ingram topped the timesheets it was all down to the 30 minute qualifying session to determine the grid for the first of the three Dunlop MSA British Touring Car Championship races tomorrow from the super-fast Thruxton circuit in Hampshire. After a cloudy start to the day and a very brief shower, the sun continued to beat down on the circuit as the capacity 32-car field took to the track. With a number of drivers pitting to swap tyres after the first laps, it was a little while before meaningful lap times were posted. The first serious time of 1:17.224 was set by Sam Tordoff in the Team JCT600 with GardX BMW 125i M Sport however Andrew Jordan then became the first to break the 1:17 barrier to top the time sheet. A number of drivers proceeded to set fast lap times only to have them disallowed for exceeding the track limits. With 10 minutes of the session completed Matt Neal was fastest in his Halfords Yuasa Racing Honda Civic Type R with MG Racing RCIB Insurance's Ashley Sutton 2nd, Sam Tordoff 3rd and Andrew Jordan 4th. 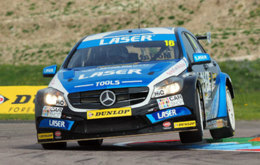 A few minutes later, Aiden Moffat went 4th fastest in his Laser Tools Racing Mercedes Benz A-Class. Approaching the half way stage, Tom Ingram went fastest in his Speedworks Motorsport Toyota Avensis. With 15 minutes remaining, Ingram was fastest ahead of Matt Neal, Ashley Sutton, Sam Tordoff, Aiden Moffat and Andrew Jordan. The second half of the session saw provisional pole change frequently. Initially Matt Neal went fastest, despite carrying the maximum 75Kg success ballast as championship leader. With 10 minutes left, Neal was still fastest ahead of Tom Ingram, Josh Cook, Ashley Sutton and Andrew Jordan. Ingram then took the top spot with a time of 1:16.161 as Jeff Smith moved up to 6th fastest in his Eurotech Racing Honda Civic Type R.
With 5 minutes remaining, Aiden Moffat put the hammer down and went 2nd fastest, just 0.033 seconds behind Tom Ingram. 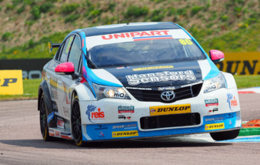 As the session ended it was Tom Ingram who secured pole position, shattering the BTCC qualifying lap record. Aiden Moffat held on to 2nd place and will start the first race tomorrow on the front row of the grid alongside pole-sitter Ingram. Matt Neal finished the session 3rd fastest with MG Racing RCIB Insurance team-mates Josh Cook and Ashley Sutton 4th and 5th. 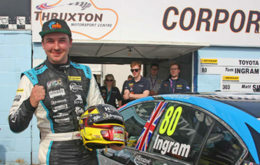 Adam Morgan completed the top 6 in his WIX Racing Mercedes Benz A-Class. Several drivers qualified out of their usually expected positions which should make for an exciting first race tomorrow. Andrew Jordan qualified 8th with Sam Tordoff 10th, Gordon Shedden 11th, Mat Jackson 14th and Rob Collard 18th. Colin Turkington was the fastest of the Silverline Subaru BMR Racing drivers qualifying 13th in his Levorg GT. Rookie driver Daniel Lloyd did well to qualify his Eurotech Racing Honda Civic Type R in 16th place on his BTCC debut. The scene is now set for a thrilling day of racing at Thruxton tomorrow with rounds 7, 8 & 9 of the Dunlop MSA British Touring Car Championship. Don't miss it!